Great Aether in Super Smash Bros. for Wii U. Great Aether (大天空, Great Sky or Great Aether) is Ike's Final Smash. Ike becomes invincible and swings his sword in front of him; anybody who he hits is sent upward. He then leaps into the air after the sent character(s) and yells "Great...AETHER!!" while slashing the target(s) seven times with his sword aflame, after which he kicks them twice, slashes them four more times, and knocks them downward with a powerful finishing blow, similar to Link's Triforce Slash. Upon impact with the ground, a large explosion knocks away the trapped character(s) and any character that happens to be too close. The DOJO!! described the move as a more powerful version of Aether. The attack does about 64%-74% damage (52%-62% from the attack, 12% in the explosion), (31%-41% from the attack, 19% in the explosion, in SSB4), and is one of the most damaging Final Smashes. If the opponent is very close to Ike when he uses it, the initial hit will deal 15% damage, but if they are further away from him it deals only 5% damage. Because the knockback from the explosion is vertical, opponents may not be KO'd immediately due to the high blast lines on some stages. In most cases, however, the move does provide significant knockback to launch enemies off the screen. Multiple enemies can be picked up in this attack and, although Ike is invincible during this move, Ike's victims can be attacked by other players along the way down. The move elevates Ike to the highest point on the stage and always takes place in the center of the stage. On 75m and the World 1-2 version of Mushroomy Kingdom, it is essentially a guaranteed OHKO because the opponent is brought up to the top platform, very close to the stage boundary. On Pirate Ship it can also OHKO, but only on Jigglypuff. The attack can be canceled by attacking at the right time. Due to the fact that Ike moves to the center of the stage when this move activates, on some created stages the downswing can be somewhat of a Sacrificial KO. As a result, Ike moves to the side instead of the exact center when using the move on Gaur Plain and Midgar. 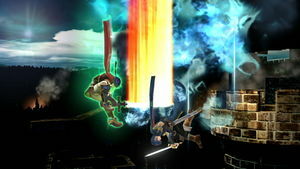 As with a standard Aether, Ike tosses his sword up into the air, and jumps after it, before attacking his foe in mid-air. It can be noted that the site of impact, following Ike's final descent, is determined by the character(s) closest to the ground directly below them. CPU opponents tend to get hit by this move, even if not caught in the initial strike. When they try to "add to the woes" of one caught in the move (as Sakurai suggested at DOJO), they do not understand to get out of the way when Ike plummets down, and get caught in the explosion. 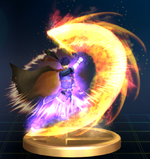 Similarly to Eruption, the flames that are part of Great Aether are changed to blue in Smash 4, making it closer to Ike's origin in Fire Emblem than before. Ike wielding the power of Yune, which might have inspired Great Aether. Oddly, this move has never been seen before in the Fire Emblem series, although it may be inspired by several elements of Ike's story. Aside from Aether being Ike's mastery skill in Fire Emblem: Path of Radiance and Fire Emblem: Radiant Dawn, it could be based on the final blow Ike deals to the goddess Ashera in the end of Radiant Dawn. For this attack, Ike uses the power of the goddess Yune to finish Ashera off, which wraps him in radiant blue fire and is the basis of the title given to Ike in the game's epilogue ("Radiant Hero" in English material, "Hero of Blue Flames" in Japanese; both come from the title of Path of Radiance in their respective language). The actual attack finishes with a downward plunge at Ashera, which is similar to the final hit of Great Aether. While the fires of Great Aether are regularly colored in Brawl, Smash 4 changed them to be blue to match Radiant Dawn. 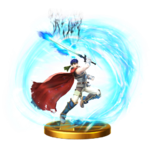 Great Aether trophy in Super Smash Bros. for Wii U.
Ike's Aether up special is combined with a relentless barrage of sword blows in this powerful Final Smash. He knocks targets into the air with an upward swing, and then they're stuck there as he strikes over and over. Finally, he slams them down to the ground and launches them. Just make sure that first strike hits! Ike's Aether up special is combined with a relentless barrage of sword blows in this powerful Final Smash. He knocks his target into the air with an upward swing, and then they're stuck there as he strikes again and again. Finally, he slams them down to the ground and launches them. Just make sure that first strike hits! Great Aether in Super Smash Bros. for Nintendo 3DS. Great Aether as shown by a Skill Preview in Ultimate. Strangely enough, despite the copious amount of fire visually in the move, it has no flame hitboxes. As with End of Day, it is possible to self-destruct with this Final Smash if it is used on a custom stage that has a gap in the center. When 3 pairs of Ice Climbers are trapped in a Great Aether, it is possible that the bigger space of characters can save them from being KO'd and save Ike from SDing on these types of stages. This can occur since all the characters trapped will make a wider collision bubble that can be hit by platforms that would not usually be hit with fewer characters and commence the final hit. In Super Smash Bros. for Nintendo 3DS, if Great Aether is used on Gaur Plain or Gerudo Valley after the bridge has been broken, Ike will instead bring the opponent above the closer side of the gap so that he doesn't SD. An exception to this is if the player activates Great Aether during the Float Islands phase of Dream Land, where Ike and the opponent will dive straight down to the blast line, resulting in a self-destruct; Ike must be facing right and standing on the left side of the stage for this to be successful. The same applies to Cloud with Omnislash. Despite this being Ike's Final Smash, it is actually only his third most powerful attack, KO power wise. Both his Eruption and his forward smash can launch opponents farther, if they are charged enough. Great Aether is his most damaging attack, however, dealing almost twice as much damage as a stage 8 Eruption. Coincidentally enough, this is also akin to Roy Fire Emblem-wise; his version of Critical Hit is also not his strongest attack, for his forward smash and higher-staged Flare Blade (a neutral special with similar predating mechanics to Eruption) surpass it in the same vein. In Brawl, if a player uses Mr. Game & Watch's up aerial while Ike is in the middle of his Final Smash, it will push opponents or teammates (in Team Battles with Friendly Fire enabled) out of the attack, causing them to not get KO'ed, but leaving them in their tumbling animation until the Final Smash is finished. It can also be done with Link's side special. In Super Smash Bros. for Nintendo 3DS, if the Final Smash is used on Metal King Dedede, he will lose his metallic texture. Even though the attack's fire has been recolored in SSB4, the trails of the sword during the attack remain colored orange like in Brawl. This was changed in Ultimate. This page was last edited on March 10, 2019, at 15:00.